The Latest episode of boruto has given us an insight into who or what the ghost he saw is. The ghostly chakra we saw which possessed people was just a forbidden jutsu used to collect the negative energy generated by shinobi who are emotionally vulnerable at the time. 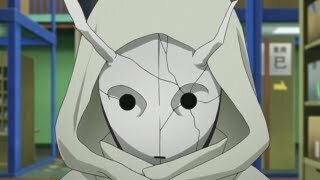 The jutsu is being manipulated by a masked figure who may be a former member of ROOT (Anbu division run by Danzo) or may be a shinobi who just has access to the research done by the scientific part of ROOT. This episode also gave some new information about Boruto's power and also the strange ghostly creature. This episode has opened up a lot possibilities and theories as to who or what Nue is, a possible connection to Kawaki and even the last Otsutsuki that is yet to be shown. In this episode we can see that the Hashirama cell is used to create some sort of gateway or portal to a strange dark dimension and a creature there absorbs the the negative energy as it powers the door or gateway. A seal of some sort is shown and it shows that it is nearing completion. When the seal is complete, Nue would awaken like that creature says and that raises the question about who Nue is. This episode also showed us the mechanics of the jutsu; the masked guy opens the portal using the hashirama cell and he or she attaches the snakely jutsu to an emotionally vulnerable person and the weird creature on the other side absorbs the chakra and negative energy. From what we have seen from episode four, the creature is connected to boruto. When boruto summoned the worm-like creature, it also opened the portal and the creature became aware of Boruto. The worm-like creature boruto summoned could have come from the same dimension as the ghostly creature or it could be Boruto unconsciously opened the gateway to that portal and with the latest episode, we know that when the gateway is open, Boruto can see thru it which shows another ability of his dojutsu other than seeing the negative energy being absorbed by the creature. He may one day learn how to open the gate on his own to access that dimension the way Obito Uchiha accesses the Kamui dimension. Lastly, who is Nue? I have a theory about who he is. From the power demonstrated by Momoshiki and Kinshiki, i doubt it was them Kaguya Otsutsuki was so worried about. We know that the standard power of the Otsutsuki was the Byakugan dojutsu and some possessed variants of the rinnegan or the rinne-sharingan in Kaguya. Nue may have awakened the a dojutsu that was stronger than the rinne-sharingan was probably sealed away by some Otsutsukis before the time of Kaguya. The Otsutsukis mad rush for power could be out of fear that Nue might one day return for revenge. Momoshiki probably saw a connection between Boruto and Nue or this last Otsutsuki and told him that his eyes would take everything away from him. This is my theory, i would like to hear some of yours, please leave some comments. I like this article, but I dontt like anime that much.